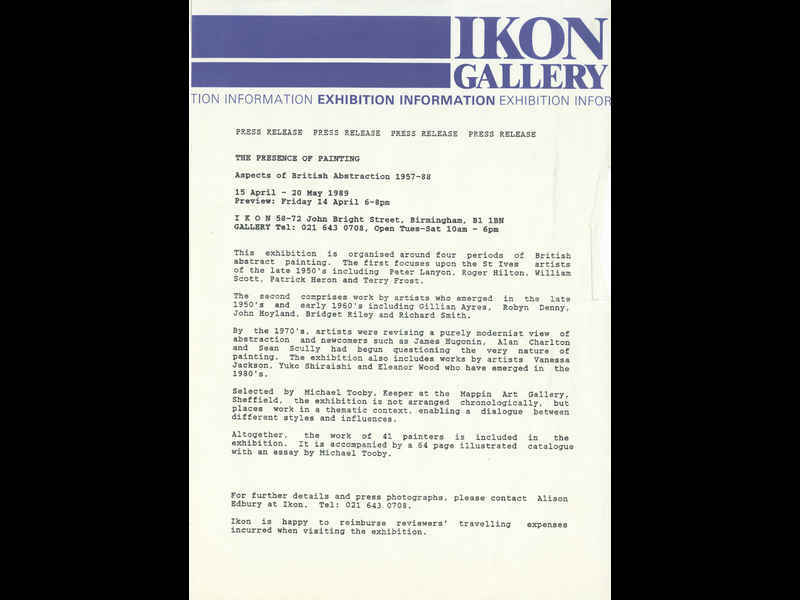 Press release for Ikon Gallery, Birmingham showing of The Presence of Painting: Aspects of British Abstraction 1957 - 1988, an exhibition that included the work of Frank Bowling. The exhibition was curated by Michael Tooby and was shown at Mappin Art Gallery, Sheffield, 26 November 1988 - 15 January 1989. The exhibition then toured to Hatton Gallery, Newcastle upon Tyne, 28 January - 12 March 1989, and Ikon Gallery, Birmingham, 15 April - 20 May 1989. The exhibition was a product of Hayward and Regional Exhibitions, South Bank Centre and came with a 64 page catalogue. The exhibition is organised around four periods of Brirish abstract oainting. The first focuses upon the St Ives artists of the late 1950’s including Peter Lanyon, Roger Hilton, William Scott, Patrick Heron and terry Frost. The second comprises work by artists who emerged in the late 1950’s and early 1960s including Gilliam Ayres, Robyn Denny, John Hoyland, Bridget Riley and Richard Smith. By the 1970’s, artists were revising a purely modernist view of abstraction and newcomers such as James Hugonin, Alan Charlton and Sean Scully hadbegun questioning the very nature of painting. The exhibition also includes works by artists Vanessa Jackson, Yuko Shiraishi and Eleanor Wood who have emerged in the 1980’s. Though there were 43 artists in the exhibition, the press release stated the total as 41.